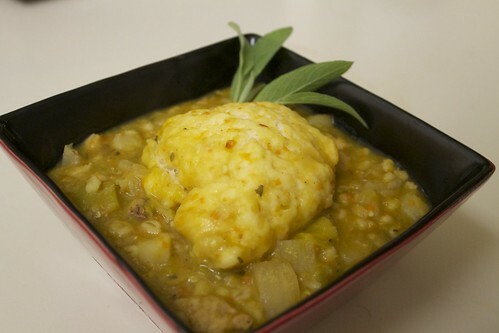 The Vegan Table | Hot vegan chick.....peas! It’s raining, it’s pouring….! Today we had the first rain of the season and it was overcast and coooold! So what better to have for dinner than a hearty stew? I found inspiration in The Vegan Table‘s recipe for Scotch Broth. Traditionally, Scotch broth has lamb, mutton, or beef, but Colleen’s recipe calls for lentils and split peas as the protein sources. The split peas add a smoky rich flavor that I suspect the meat usually provides. The boyfriend is a dumpling fanatic, so he made some dumpling dough from All Recipes and we cooked them in the stew over the last 15 minutes. I’m sooo excited to get a chance to use my shiny new Cuisinart enameled pot, which I found at TJ Maxx for half price. Whoo! I made a few modifications to the recipe so I feel comfortable transcribing it (with my mods) below. Soak barley, split peas, and lentils for 1 hr (I did only 20 min) in a bowl with enough water to cover. Meanwhile, saute the leek, onion, and carrots in a soup pot with a little olive oil. Add the potatoes and garlic, saute a few minutes, then add broth and the bean/barley mix (that has been drained and rinsed). Add spices and TVP and simmer until everything is tender (about 45 min, less time if you soaked the grains longer). 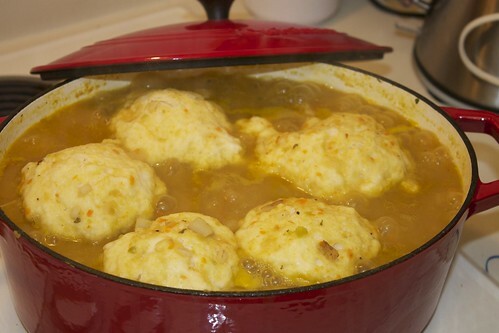 When things are almost done, drop spoonfuls of dumpling batter (recipe below) to the stew, cover, and simmer 15 min. Mix dry ingredients and cut in margarine. Stir in milk to make a soft dough. Follow directions above. Hot, hearty, and filling. Yum! I was surprised I didn’t even have to add a lot of spices to make this tasty. The lentils and veggie stock added so much flavor! The TVP reminded me of chicken chunks in stews or curry and soaked up all the flavor from the broth. Perfect! I can’t wait to have this for lunch (and dinner) tomorrow! This week’s cookbook challenge features recipes from Colleen Patrick-Goudreau. 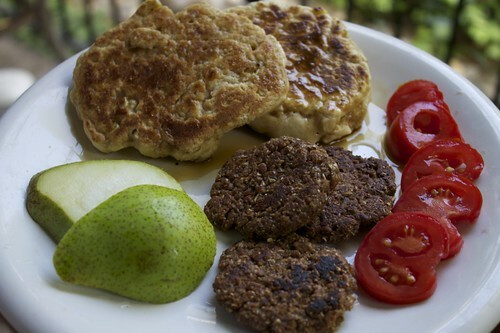 We tried out the sweet corn pancakes from The Vegan Table along with sausage patties from Hell Yeah It’s Vegan, pears from our CSA box, and fresh sliced tomatoes from our garden. The pancakes came out more like biscuits so next time I would add more water to the batter and try to make thinner cakes. I used half whole wheat pastry flour and half AP flour to make them healthier but not too heavy.